Overall, at 3 out of 5 stars, Medix Select Bactipro is a slightly above average probiotic. This probiotic actually comes in a chewable wafer. I like the idea of a chewable, especially for those who aren’t particularly fond of swallowing capsules or tablets. Bactipro comes with a lot of additions other than probiotics, such as prebiotics, fiber, antioxidants, and phytonutrients. 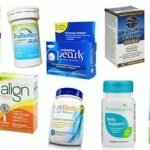 This is something different that I haven’t seen other probiotics contain, so I thought it was interesting. To name just a few, it has kale leaf powder, grape seed extract, cauliflower fruit powder, carrot root powder, and cranberry fruit powder. You also don’t have to refrigerate this probiotic, which makes it more stable. As I said, I like the idea of a chewable probiotic, however this one falls short in my mind. The wafers are HUGE and they taste disgusting. They were very gritty and seemed to stay in my mouth and teeth for an unpleasantly long time. The directions say to take 3 wafers daily, either all at once or spread throughout the day. I took mine in the morning and wanted to gag at how sweet it was. I suggest taking them after you’ve had a meal to hopefully mask the odd, sweet, gritty nature of the wafers. This may seem nit picky but the Bactipro bottle is absolutely massive (the size of my hand). I know from experience (and testing out countless probiotics) that the bottle/packaging is important. I don’t want to lug around a giant bottle the size of my hand or attempt to store it in my already cramped cupboard. This probiotic is also not safe for kids and is very expensive. Last but not least, this probiotic contains MILK. This is a big disappointment because milk is such an issue for so many people. Overall, Medix Select Bactipro is a slightly above average probiotic because it contains prebiotics, fiber, antioxidants, and phytonutrients, doesn’t have to be refrigerated and is a chewable wafer however, the wafers taste really gross, the probiotic is expensive, and it’s not allergy friendly. 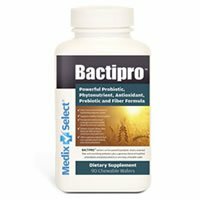 Medix Select Bactipro has 6 different probiotic strains in 350mg. In particular, I like the use of Lactobacillus acidophilus in the strain profile. This is a well-researched strain that may be able to help with problems such as gas, bloating, and constipation. Lactobacillus acidophilus may also help treat vaginal yeast infections, lactose intolerance, urinary tract infections, and Crohn’s disease. 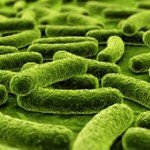 This probiotic strain has actually been known to be aggressive and can overrun other “good” probiotics. Bactipro does have allergy concerns. If you’re lactose intolerant, stay away from this probiotic. Other ingredients include: erythritol, stearic acid, citric acid, natural flavor, magnesium stearate, stevia leaf extract, and sipernat. 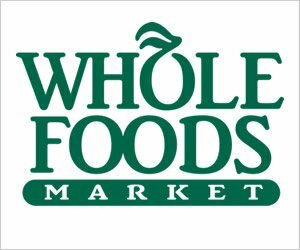 For 90 chewable wafers, it costs $39.95 + $6.95 shipping ($46.90 total). You have to take 3 wafers per day, so the daily cost ends up being $1.56. However, since you’re getting so many other additions such as fiber, antioxidants, phytonutrients and prebiotics, I do think that the price is a decent value for this product. I didn’t experience any negative side effects from this probiotic, which made me very happy. No stomach cramps, pain, or gas. With 6 probiotic strains in 350mg, it seems to be fairly gentle. 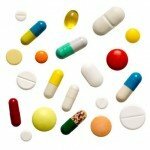 Medix Select does offer a satisfaction guarantee. You have 30 days to try the product and if you aren’t 100% satisfied, then you can get your money back (minus shipping and handling). I love to see satisfaction guarantees from a company, kudos! To buy Medix Select Bactipro, click here. Allergy Concerns Yes, the wafers contain MILK.